Since 1994, City Works has been publishing the poetry, fiction, prose, and artwork of City College Students along with the work of local, national, and international writers and artists. Over 50% of the work in the journal is by student writers, poets, and artists. These pieces are chosen by the student editors of the Introduction to Creative Writing course that is team-taught by the City College Creative Writing faculty, which includes Chris Baron, Nancy Cary, Gwyn Enright, Hector Martinez, Jim Miller, and Donna Watson. The students in this course evaluate every submission and their rankings determine the Best Student Fiction Award, the Best Student Poetry Award, the Best Student Creative Nonfiction Award and the award for the Best Student Cover Design. The faculty editors select the Featured Writer from a pool of noteworthy local authors. Finally, the winner of the National Award is chosen by the faculty editors from a pool of hundreds of submissions from around the country. Recent writers featured in the journal include Steve Kowit, Jimmy Jazz, Mary Williams, Sue Luzzaro, and Donna Watson. Our intention is to create a journal that reflects the identity and character of San Diego City College, provide a venue for emerging local artists, broaden our reach nationally, and encourage interaction between the college and the community at large. 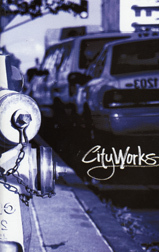 City Works can be purchased at the San Diego City College Bookstore. Copyright © 2016 City Works Press. All rights reserved.